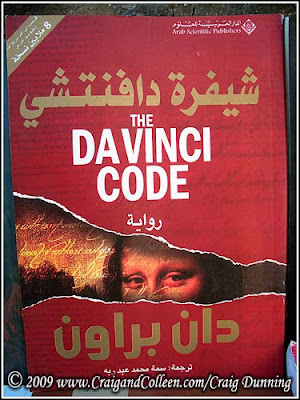 I wasn’t surprised to see The Davinci Code in Arabic, but I was a little surprised to see that it was published by the Arab Scientific Publishers. Actually, after further consideration, the publisher didn’t surprise me. For the record, there may have never been published a less scientific book than The Davinci Code, and the Arab Scientific Publishers has undermined any shred of scientific credibility with their decision to publish this book. If you are interested in why I would say that, here is one good resource. My 5-year-old daughter does not yet take the Lord’s Supper, so she is very jealous and attentive to all that goes on during that event. In Israel we use matza for the Lord’s Supper, and when it is broken, it comes out in random sizes; some larger, some smaller. This past Friday night, I got a rather large piece of matza, which immediately drew her attention. Clearly, from a 5-year-old’s perspective, she was correct. In fact, her reply caused me to take another look at the broken piece of matza resting in my hand, . . . and to reconsider how I try to communicate important truths to her . . . and to others. It was the day of Preparation of Passover Week, about the sixth hour. “Here is your king,” Pilate said to the Jews. But they shouted, “Take him away! Take him away! Crucify him!” “Shall I crucify your king?” Pilate asked. “We have no king but Caesar,” the chief priests answered. Finally Pilate handed him over to them to be crucified. Don’t Let the Sun Go Down . . .
you are still angry, and do not give the devil a foothold. Dr. Doug Bookman suggests that Judas is an example of this verse in that in his anger at being rebuked by Jesus, he gave the devil a foothold. Let this be a warning to us all: be slow to anger and quick to forgive.